In the past, we’ve talked about using an application such as HandBrake 0.9.4 ( ) to rip your DVDs to watch on an iPhone or Apple TV, and covered some of the frequently asked questions about DVD ripping. But what if you want to make an exact copy of a physical DVD to use as your ‘viewing’ disc and keep the original safely on the shelf? Or how about if you’ve received (or created) a DVD of home movies or a wedding and want to duplicate it for family members. Here’s what you need to know. If you want to make copies of that DVD your cousin sent you of her son’s bar mitzvah (or any other unprotected DVD), the process is relatively simple. Insert the DVD into your Mac’s optical drive and launch OS X’s built-in Disk Utility app (found in the Applications/Utilities). Click the New Image button at the top, select the DVD in the dialog box that appears, and in the Image Format pop-up menu choose DVD/CD Master. Pick a name and destination, and click Save. After a while, you’ll have an image file with a .cdr extension. That disc image contains an exact copy of your DVD, which you can backup on an external hard drive for later use. To burn that image as a DVD that you can watch in a standard DVD player, launch Disk Utility and you should see the image listed on the lefthand side. If so, click the image name, and then click the Burn button at the top. If you don’t see it listed, click the Burn button first, then navigate to the image’s location, select it, and click Burn. Now that you have an unencrypted VIDEO_TS folder, you have several options. If you own a recent version of Roxio’s $100 Toast Titanium or $50 Popcorn, you can select the Video tab (Toast) or Copy tab (Popcorn) and click the VIDEO_TS Folders option. Drag your VIDEO_TS folder into the window, insert a blank DVD, click the big red Record button, and wait for your DVD burner to spit out an exact copy. If you don’t have either of those apps, you can download the free DVD Imager 1.6, which can create a DVD image from your VIDEO_TS folder. Unfortunately, it doesn’t work with Snow Leopard. If you have an older version of OS X, it’s the easiest way to create a disc image. If you’re running Snow Leopard, you can accomplish the same result—also for free—but it involves a bit of Terminal magic. There are a few methods that work, but I found an easy one that requires very little typing of Unix commands. First, create a new folder on the desktop and name it the title of the movie, using only upper-case characters and no spaces (underscores are fine) for compatibility reasons. (For example, for the Monty Python and the Holy Grail DVD I ripped, I named the folder HOLY_GRAIL.) Now put the entire VIDEO_TS folder into the folder you just created. It will now take several minutes for your disc image to be created. 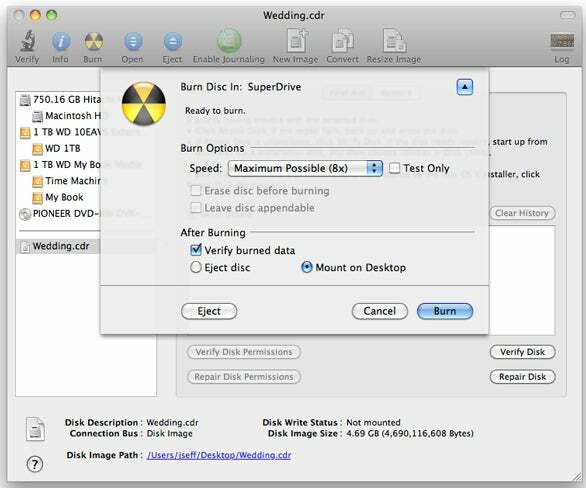 But when it’s done, you can burn the .iso image in the exact same way as described in the homemade DVD section (launch Disk Utility, click Burn, select the disc image in the Finder, and follow the directions to burn your DVD). You can also save the image you created if you ever need to burn another copy.